Welcome Monday and not so welcome thunderstorms~~ of course my Miss B is not happy about the cracks of noise and beating rain. However the garden loves it and my new blooms are raising there little faces high to receive a nice spring drink. 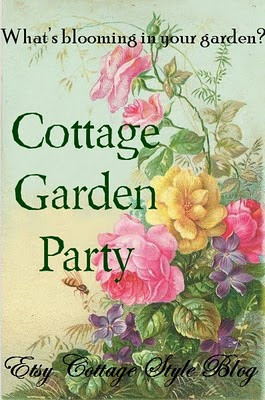 Today is the third Monday of March and time for Etsy Cottage Style Blog to celebrate the cottage gardens. Visit HERE for the list of more participants posting. Remember each Monday is a ECS event that runs all week long which gives us plenty of time to join the fun. Not only is my Texas garden enjoying the warm weather, but I am inspired to create with the encouragement of my pretty blooms. Come take a walk with me around the garden to visit a few early bloomers. Starting with a pretty Saucer Magnolia. Just peeking through the ground is one of several Cone flowers. These will be a pretty dark pink. Here grows gorgeous large leaf English Ivy with Pansies. My Hydrangea garden is peeking through the ground as well with some nearly in bloom. These will be pinks, white and blue. Can't wait to dry a few for inside vignettes. Dianthus is another pretty and lasted all winter long this year with our mild winter. From my rose garden comes the first Redpink Roses. Soon the bushes will be covered. This garden arch~~and my pride and joy, will hold the most gorgeous mini White Carolina Roses soon. I trimmed this last week and with the warm weather, it has more new growth in just a few days. Right outside my studio door grows this gorgeous Camellia bush. Yesterday my dear guy picked this pretty bloom. They only last a few hours off the bush and the petals shed like crazy. But for a short time, the flower is gorgeous on display. From the studio, I also have a garden of spring blooms to share. Starting with this fresh spring garden tray and darling little tea pot. The sweet Caroline Wren has long flown off to his new home in the midwest and the nest along with him. But more pretty birdies will be on the way. These were painted on vintage fluted cake pans. How about a French watering can to water those pretty garden blooms? This sweetie is new and now available in my shoppe. Chaumiere Fleurit. Thank you for stopping by to visit and view my spring garden blooms. It's back to the studio for me, but for a few minutes more, I will enjoy a cup of tea in a new spot in my studio overlooking gorgeous pink roses right outside the window. Join me will you? They are not fully in bloom yet, but I will dream of the sight soon to follow. It's still storming but wishing you Blessings and Blue Skies always.